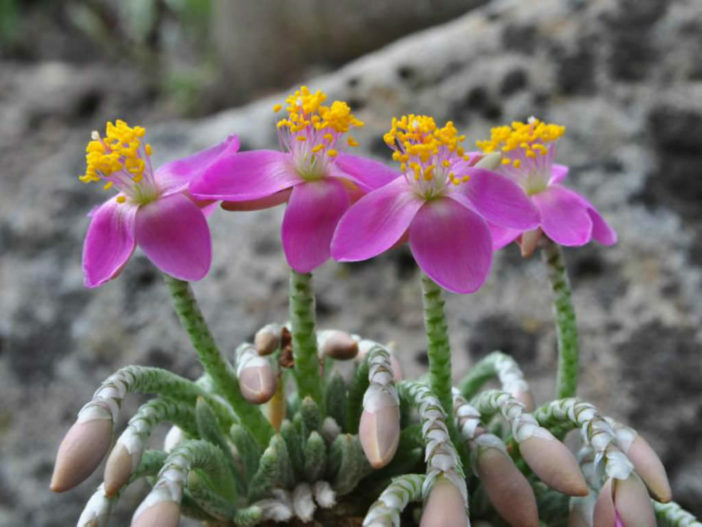 The genus Anacampseros was split into Anacampseros and Avonia from South Africa, and Grahamia from the Americas and Australia. Many plant labels and plant nurseries have not yet caught up with this change, so all these plants may still be seen labelled as Anacampseros. Avonia is reserved for the species with tiny leaves hidden by papery stipules which form a protective layer along the stems. These bright white scales reflect a proportion of the solar radiation and protect the leaves from the noon-day sun. The small, solitary, greenish-white flowers are produced on the tips of the stems. The roots form a small caudex. Light: Avonia do well in light shade to full sun. High levels of light are needed to flower and for good plant development. Water: Water normally in the growing season from March to October, keep dry in winter. Temperature: It is quite frost resistant if kept dry, hardy as low as 23°F (-5°C). Soil: Since roots are quite shallow, use a cactus mix or add extra perlite or pumice to regular soil potting soil. A gritty, very free-draining compost is suitable, and clay pots help the plants to dry out between watering. For best results, use a shallow pot, and only use the smallest diameter pot that will accommodate the plant. Fertilizer: Feed with a high potassium liquid fertilizer in summer. The seeds germinate very quickly at temperatures between 59 and 70 °F (15 and 21 °C). In cultivation the young Avonia plants develop much quicker than in their natural surroundings, where they don’t get ample water supply. Generally they are not easy to raise from seed as too much water kills them immediately, which also happens when they are not watered at all. Although regarded as a choice and difficult plant, in cultivation it is relatively easy. Avonia grow very slowly and requires careful cultivation. Clustering in cultivation, if grown correctly, it will reward the grower with generous displays of tiny flowers. Avonia grow well at moderate to cooler temperatures in partial sun. Bright light enhances leaf colors and makes for a compact plant. They enjoy a gritty free-draining soil with added organic material and low to moderate watering depending on the species. A collection of these plants can be housed in quite a small space.